Congratulations on the new tapestry loom! I have been watching your posts and admire how you have concurred the diagonal. 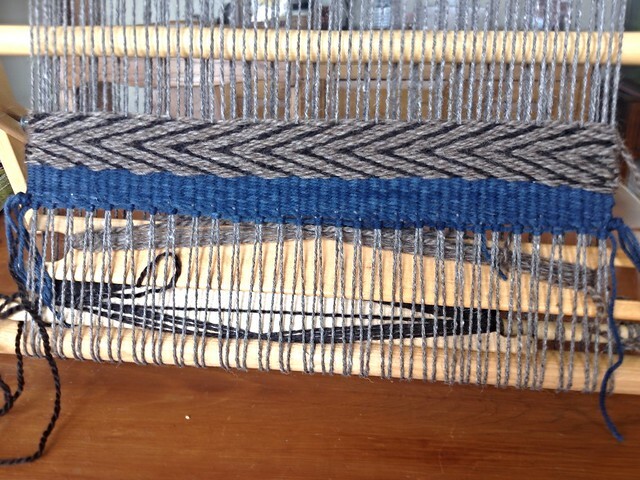 This recent start on the new loom looks most interesting, great color also. As a printmaker I am finding weaving to be a real challenge. I purchased a Schacht rigid heddle loom in the fall ( finished a few scarfs in bamboo yarn & many experiments of tapestry, rugs, mug rugs). My husband & I have 5 printing presses between us so I promised myself only 1 loom. 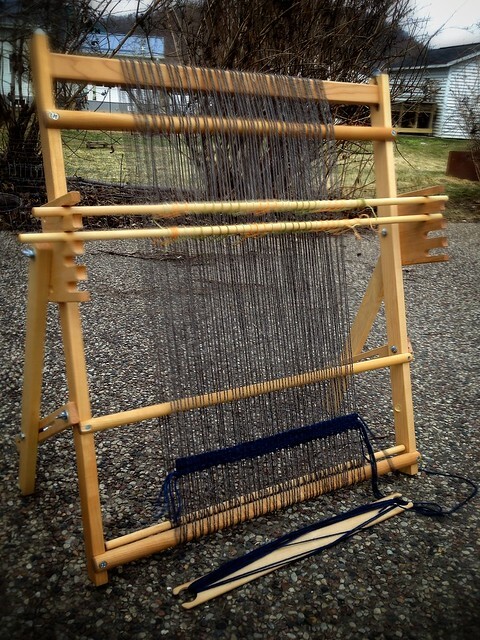 Now making room for a 2nd loom (tapestry) ordered from Meghan Shimek. What yarns have you found work best for tapestry? I have purchased Universal classic worsted tapestry yarn and was intrigued by Elsa Williams Tapestry yarn. Best to you, the yarn and the looms. J. Thank you very much for your kind words. You see how it goes? Just one loom… and then one more. Be careful! As far as yarn, I’m still a novice. I tend to use what I can find locally or second-hand. Maybe someday I’ll be able to dye colors to add to the fun, but so far, I’ve been happy with wool for crewel or tapestry weaving (found at thrift stores) and embroidery threads. Have fun with your new loom! !